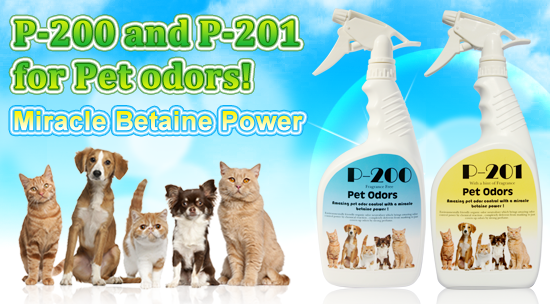 P-200 and P-201 for Pet odors! Eliminates Pet Urine & Feces odor instead of mask it with a Miracle Betaine Power! 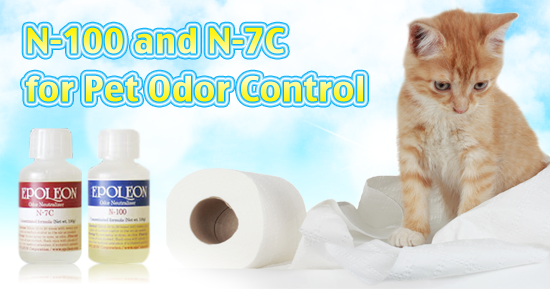 Epoleon P-200 and P-201 also react with fatty acid putrid odors and neutral odors such as the smell of persistent. It is amazing odor neutralization! Epoleon P-200 and P-201 are environmentally friendly organic odor neutralizers that work upon contact with odorous gases. This means that when sprayed P-200/201 develops a strong interaction with the molecules of odorous gases. Having no contact with odorous gases will not produce any results. This is a major difference between neutralizer like our P-200/201 and masking type deodorizers which simply mask, but not eliminate, odors. Odor neutralizer!....... Another concept of odor control. 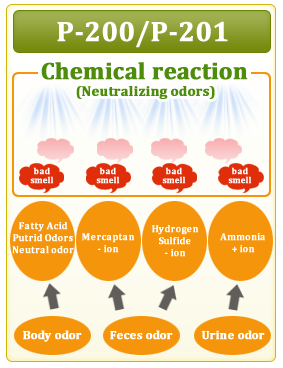 - What is odor neutlizer? 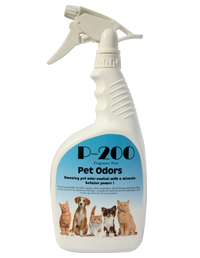 P-200 has no fragrance and is designed to work on Ammonia odors such as urine. P-201 contains a hint of fragrance which has been deliberately added as a Counteractant to react with both alkali odors such as Trimethylamine and Ammonia (urine, etc. ), and acidic odors such as Hydrogen Sulfide and Methyl Mercaptan (feces, etc.) simultaneously. It is truly a revolutionary odor neutralizer in that it reacts with all of the above mentioned odors simultaneously. P-200/201 can be used for dead animal odors, including skunk odor elimination, as well as for bird droppings and nest odors in attics and behind walls. N-100 and N-7C are alternate products for P-200/201. N-100 and N-7C are industrial strength, full concentrated formulas. N-100 is fragrance free extra strength formula and alternates P-200. N-100 is used for same applications as used for P-200, and can be diluted with water up to 20 times before use as spray method. N-7C is an extra strength formula with a fragrance, and used for same applications as used for P-201. N-7C can be diluted with water up to 20 times before use. Pet odors can be caused by a number of things. The first approach is to try and identify the root of the smell -for instance - cat urine odor, dog urine scent, and/or other pet urine smell. These unpleasant scents and aroma may also develop unnatural odors as a result of skin disease or other disorders. In addition, these unpleasant smells may also become contaminated with odors from other sources in their environment. Pet urine odor and other pet area scent problems result from ammonia, mercaptans, amines, and skatole gases emitted from urine and feces. Left untreated these pet odors can increase in concentration resulting in health problems for animals and humans alike. Even low levels of ammonia can cause damage to the respiratory tract, high rates of pneumonia, reduced weight gains and excess stress on your pets. The second approach is to apply deodorizer products. There are several methods that work such as soda water, soapy water, or perfumed soap, however, these methods do not act and take action to neutralize and break down the source of the odor molecule. The best pet odor control product for this purpose is Epoleon. Epoleon is a deodorizer which meet up these conditions. Our pet odor control neutralizer removes and eliminates the malodors by chemically reacting, counter-acting, neutralizing and dissolving the odors and toxic gases which are unpleasant to humans and animals. Epoleon is made from fine, organic chemicals and complex compounds that are biodegradable, non-toxic, water soluble, and emulsifiable, important factors to consider in this climate of ecological awareness. The compounds react to breakdown molecules so that odor is no longer present. Important! Epoleon's pet odor control should be handled safely so that both you and your pet can live comfortably. Epoleon N-7C formula has the ability to react with a broad range of gases. It was designed to react upon the odors produced by the disposal of food and any other waste materials containing a high amount of neutral gases as well as acidic and alkali odors by a special inclusion effect. N-7C formula neutralizes by means of chemical reaction and counter-action enabled by a fragrance plant extract, one of its main ingredients. PC-300 odor control neutralizer dissolves and neutralizes toxic and poisonous gases which include acidic odors (Hydrogen Sulfide, Methyl Mercaptan) and alkali odors (Ammonia, Trim ethylamine) at the same time. 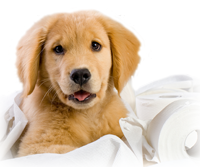 PC-300 is non-toxic and biodegradable so it is safe for environment and your pets.